Visualizing text is a proven way to improve reading comprehension. It is a technique that can be taught using this simple, step-by-step strategy from literacy consultant Cathy Puett Miller. Included: Tips and resources for developing students' comprehension skills. 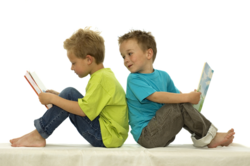 "Proficient readers spontaneously and purposely create mental images while and after they read. The images emerge from all five senses as well as the emotions and are anchored in a reader's prior knowledge." Each day, our students are bombarded with the visual images of TV and video games. In contrast, most students view reading as a passive activity. But a simple technique -- visualization -- can transform students of all ages from passive to active readers; visualization can help students cross the boundary to improved comprehension. "That very night in Max's room a forest grew and grew and grew until his ceiling hung with vines and the walls became the world all around." After reading that quote, share with students the images you visualized as you read it. As I read that passage, I thought about the words and I imagined what the characters looked like, what they were doing, and what their surroundings were like. I shared with students that I imagined a window with a moon shining through it. Saplings began to sprout and quickly grew leaves and stems. (The scene was like those time-lapse photography images you see on the Discovery Channel.) I saw little vines spreading their tendrils down the walls and across the ceiling. Before I knew it, the entire room was green and leafy, and much darker than before. When you finish sharing your thoughts, let students try the same technique on their own. Share a highly descriptive reading selection appropriate for students' listening vocabulary level (up to two years above their reading vocabulary). If necessary, before reading share a vocabulary mini-lesson to introduce unfamiliar terms. Depending on the ages of your students, you might choose from the following titles or use a title of your choice that provides excellent descriptive passages. Before reading aloud to students, offer the suggestions below. While I read, close your eyes and listen carefully. Stay alert and think about what happens in the story. See if you can imagine the scene the words describe. Pretend you are making a movie; what would you see from behind the camera? As you listen, when you hear describing words (adjectives) -- such as hot, red, musty, or quiet -- use those words to help paint pictures in your head. For students identified as "at-risk", you might discuss what it feels like to be hot, or what shade of red a tomato might be, or how musty gym socks smell when they've been in a locker for three days. Give them concrete ideas and connect to prior knowledge. In other words, turn on the thought processes and you will prime students to do the same when they read. Remind them to think about what characters smell, taste, feel, hear, and think. Good readers do that. Also, point out to students that this technique will help them remember what the story is about. After reading the selection, direct a class discussion in which students share their images. Emphasize that everyone's visualizations will differ. Be sure to acknowledge and value all students' ideas. If they create images that reflect the words, praise them and encourage comparison/contrast discussions. If students have difficulty creating an image, try another short read-aloud session and practice modeling again. Ask questions to lead them to create images on their own -- questions such as Does this remind you of anything in your life? or What do you think the dog looked like? or Do you have a dog? How do you think this dog is the same as yours? Different? Next, use a different selection from the same or another text. Tell students you will share part of a story (show no illustrations). Ask them to draw their own illustrations as they listen. The physical act of creating a picture can help students grasp the concept of visualization. To connect this image building with comprehension and to reinforce the concept of visualization, make time to share and discuss students' images. That might be done in small groups first, then as a class. After students begin to grasp the concept of visualization, be sure to reinforce it frequently. Make visualization a part of class every day. Those who have more difficulty with the concept will learn from peers' expressions imagination. Encourage those who struggle to ask other students how they came up with their ideas and to learn from one another. Integrate this exercise into daily class read-alouds and silent reading. Incorporate not only physical images, but also ideas about feelings the characters might experience. (That will exercise students' critical thinking skills, especially their skill at making inferences.) Use the combination of drawings and mental image-making that works best for your students. As you progress, you can move from descriptive texts into expository texts. By using visualization, you open the door for life-long reading. Most of all, you help develop in students the habit of actively thinking about what they read -- which leads to greater retention and understanding. Encourage students to practice the ideas outlined in this article as they read at home. Assign homework that includes a reading from an assigned text. Ask parents to read the selection -- or part of it -- with their children and discuss the possible images. You might need to provide some direction for parents, because some adults don't have the skill either. Have students read a pre-printed passage and use the visualization strategies taught in class. Before duplicating the passage, insert a dot or asterisk every 3-4 sentences. Each mark represents a "pause-for-reflection" point -- a point at which students should stop and think about the words they have just read (and reread as necessary). Before they proceed, ask students to create a mental picture (think about what they read) and circle the words that helped them create their images. Have them select one "pause" and draw an illustration or use a visual organizer to hone in on the ideas and images the author describes. When reading in a content area, encourage students to use these visualization techniques to understand more of what they read. Expository text is full of images -- maps, charts, text boxes, sidebars, and more -- that aid in comprehension. Mosaic of Thought: Teaching Comprehension in a Reader's Workshop by Susan Zimmerman and Ellin Oliver Keene (Heinemann, 1997). Cathy Puett Miller is a passionate advocate for early literacy. Known widely as "The Literacy Ambassador," Miller connects children, families, and teachers with resources to create positive early reading experiences.